Each time I reach for a brush, I access water in the process. Each time I reach for a color to bring life to the image growing before me, I am casting to a rising thought; a potential inspiration. Each time I enlist imagination to see the thin, spare line between what is and what can be, I am watching for the tell-tale trace of the heart-beat just beneath the surface. Each time I feel the connection between an artistic vision and the viewer’s joy, I am feeling the strike of primordial energy connecting to feed and sustain the species. Each time I stand back to observe the image forming on the easel, I see the beauty of life at the edge of the water – beckoning me to engage, drink and realize possession is but a temporary illusion. ‘Tis mine in mind, ephemeral as the mist. ‘Tis we – forever bound – as inseparable: genetic. Each time I remember, each time I remember. Each time, I know. I am connected through art and water. Each time I fish — I am haunted by memory… and I smile. Every story has in its innards a story just hoping to be heard. The story for this collaboration tells of serendipitous inspiration … a comment and an image – placed on on a social media site. Easy enough. A lot of us smile when we fish. But only the artists in the group understand the true meaning behind that smile of which Diane speaks. It is a smile of devotion, passion, love and ecstasy. As well as pain, loss, separation, disappointment and hurt. All of these emotions are daily fraternity of the experience the artist feels when she – or he – engages with their creative juices and the object of their effort and talents. For the artist – ‘connecting to/with water’ both important, necessary and done – in a different manner. For the water-colorist, water IS the fuel of their medium. Not so much with the oil, pastel, ink, color pencil artists. The sculpture – if in clay – revisits the intimacy with water as well. But all artists must transition concepts formed in their minds-eye to whatever surface they are working on. Those who bring water to their work, must have a deep and liquid affinity with their subject as well. Those who do, do not need explanation – their passion is spread across many disciplines and examples for all to see. For the artist whom also participated in the art of fly-fishing, water is the beginning – the force – and the end, of a multi-layered experience; all wrapped into one. The water is the center of everything about fishing. Water is the fishes habitat. Water is the environment the fisherman must conduct his interview with the point of his pursuit. Water is the vehicle of the fisherman’s pleasure. Without water- there is no fishing. The artist – who is also a fisherman – is both burdened and blessed, with a burning duty/desire to bring to life the vision of the watery world in which each fisherman pursues his or her desires afield. To present memory and introduction is a wonderful opportunity and honor for every artist who takes up the challenge. Thus, when the artist readies to match wits with the piscatorial delights of their favorite water way, there is so much more going on than a mere selection of equipment, reading water, battling elements, controlling adrenaline. The artist finds themselves in a mode of recording the ‘vision’; moment; feelings; atmosphere … and action! All the while they are satisfying their ‘inner fisherman’. As well, the works produced by an artist, most often do not afford the artist the luxury of adorning their walls for very long. Art is their product/commodity’/livelihood and they must move the art; sell it; in order to make a living. Thus, connections with the art are ephemeral. Emotions can – and often do – run deep. The very life blood of an artist is embedded in the paint they use, the stone they cut, the clay they toss, the fly they tie, the rod they build, or the story they write. It is a temporary acquaintance the artist makes with their work. But it is becomes a life long conversation for the artist and their clients (friends!) .. all tied to the art they so enjoy. 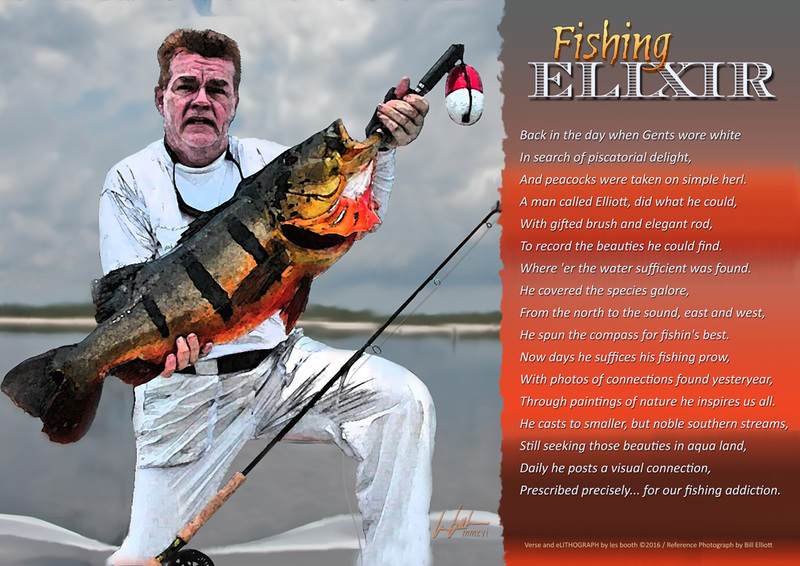 Knowing this, it is not hard to see why when they fish … the artist cannot help but smile.